Vegas is one of those places I definitely love to hate. While I am extremely fond of the city’s lack of open container laws and social acceptance of day-light drinking, I hate the plethora of fountains, green lawns and lakes in the middle of desert and kind of hate the over-the-top excess and tackiness synonymous with the city. That being said, from great shows to highly rated restaurants, along with some stunning deals on Vegas vacations, a little trip to Sin City has been on my radar recently. It is certainly no secret that Vegas has been especially hard hit by the economic recession. While some may claim part of the bust is in direct relation to an over zealous boom in the inflated good times of the recent past, whatever the reason, there are a whole lot of empty hotel rooms around the strip these days, which has made for some incredible deals on cheap Las Vegas hotels. I recently wrote about how the five-star Wynn Hotel on the Las Vegas strip was offering up rooms for just $139/night, including a $75 resort credit. However, this is certainly not the only deal to be found at a high-end hotel on the strip. In fact, Jen Leo at the Los Angeles Times recently wrote all about how to find cheap rooms at 5-star hotels in Vegas. Her tips include signing up for e-mail newsletters and using a few different sites to scope out deals. As it turns out, cheap Vegas hotels aren’t the only deals to be found on the strip. With hotel rates down, many entertainment producers in Vegas have also been forced to drop prices on Las Vegas show tickets (few people are willing to spend more than the cost of their room on a ticket to show they found). According to a recent article in Variety, Las Vegas show have partnered with hotel to lure recession hit audsand lowering prices has been one huge part of this campaign. There is also a plethora of deals on cheap flights to Vegas right now. 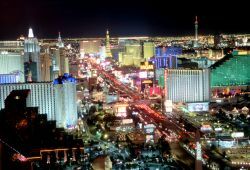 If you opt not to bundled your flight and hotel together as part of a Vegas vacation package (which there are also some pretty insane deals on right now), you can also get some great fares and find cheap tickets to Vegas on a variety of different airlines.